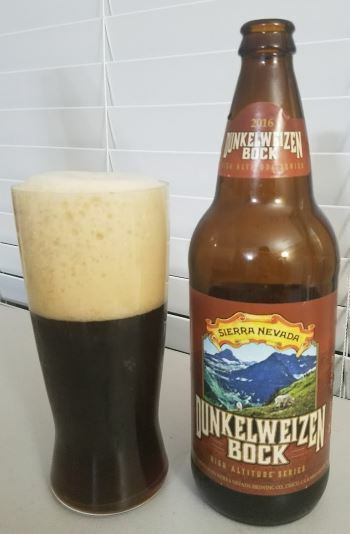 A member of Sierra Nevada’s High Altitude series, Dunkelweizen Bock is a traditional dunkelweizen, a dark wheat German beer style. A classic style that you don’t see that often these days. The head is heavy and sticky and hangs around. The nose is malty and bready with some banana. The middle is sweet with molasses and has oodles of the characteristic cloves, and the finish is sweet banana bread. The body is medium to heavy, and the alcohol is a reasonable 7.2% ABV. This is a really nice heavy winter beer for those inclined to indulge in sweeter styles. I give it a 4.4 out of 5. This entry was posted in Reviews and tagged Ale, California, Dunkelwizen, German Beer, Sierra Nevada, Wheat Ale, Wheat Beer on December 30, 2016 by Xander. 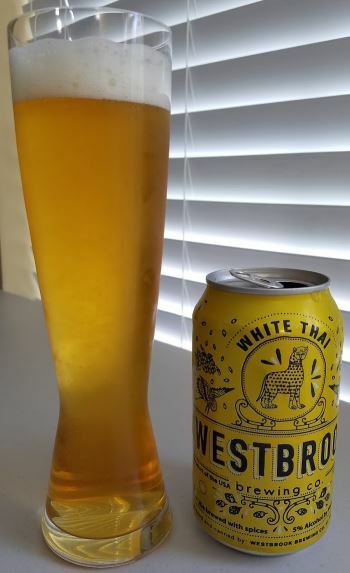 “Inspired by the flavors of Southeast Asian cuisine” is what South Carolina’s Westbrook Brewing Co. says about White Thai, a wheat based ale with lemongrass and ginger instead of the traditional witbier’s coriander and orange peel. It’s a mild drinking ale, as appropriate for a wheat ale, with lemongrass and a bit of yeast in the nose, some orange and ginger in the middle, and a hint of pepper in the finish. There’s a slight buttery undertone, but overall the character is relatively light and summery. The body is medium, and the alcohol is a reasonably low 5% ABV. I give it a 3.5 out of 5. This entry was posted in Reviews and tagged Ale, South Carolina, Spiced Ale, Westbrook, Wheat Ale, Wheat Beer, Witbier on October 4, 2016 by Xander. 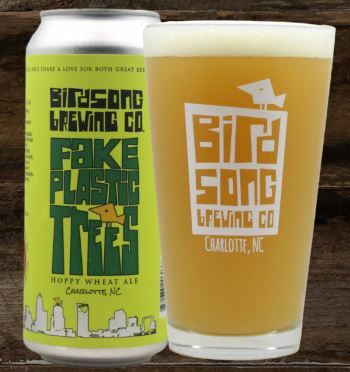 Continuing with beers from right here in Charlotte, Fake Plastic Trees is a hoppy wheat ale (think wheat IPA) from our friends at Birdsong Brewing Co. To start, the head is heavy and creamy, as befits a wheat ale, and the unfiltered golden hue is hazy. The nose has orange, lemon, and lemongrass scents. The middle is hop-forward with an American IPA profile (lemon and hint of pine) but served on a bed of wheat toast. This fades to bit more lemon and some grapefruit in the finish with the wheat continuing to balance things out and soften on the tongue. The body is medium and the alcohol is moderate at 6.4% ABV. This is a fun mash-up between a wheat ale and an IPA that will probably be best enjoyed by IPA fans. I give it a 4.2 out of 5. This entry was posted in Reviews and tagged Ale, American IPA, Birdsong, Charlotte, IPA, North Carolina, Wheat Ale, Wheat Beer on September 16, 2016 by Xander. Scattered Sun is a Belgian-style Witbier from Southbound Brewing Co. of Savannah, Georgia. The head is foamy and voluminous, dissipating fairly quickly but leaving an inch or so that lasts for quite awhile. The nose is fruity and yeasty and definitely Belgian. The middle has tart lemon, sweet orange, and a bit of coriander. The orange strengthens in the finish along with a nice dry wheat flour and a bit of breadiness. A very pleasant and refreshing brew, and a relatively light 5.2% ABV makes this a perfect summer drink. I’m enjoying it quite a lot. I give it a 3.7 out of 5. This entry was posted in Reviews and tagged Belgian, Belgian Ale, Belgian White Ale, Georgia, Southbound, Wheat Ale, Wheat Beer, Witbier on June 4, 2016 by Xander. Allagash Odyssey is a dark wheat beer in the Belgian Strong Dark Ale style, brewed with Belgian candi sugar and aged in oak. Another way to describe it would be “brilliant.” The nose holds promises of raisins, figs, and ginger. The middle is mellow and muted due to the wheat, with clear and refined flavors of raisins, plums, dates, and a bit of coffee. While the middle is sweet, the finish is dry and flavors that come forward are vanilla, cocoa and tobacco. The body is heavy and the alcohol is an age-able 10.4% ABV. The suggested drinking window is two years, and the example I’m drinking in February 2015 was bottled in January 2014, and it’s clearly still in its prime. My bottom line is that this beer is another long home run from Allagash. I give it a 4.9 out of 5. This entry was posted in Reviews and tagged Aged Ale, Ale, Allagash, Belgian, Belgian Ale, Belgian Strong Dark Ale, Maine, Oak Aged, Wheat Ale, Wheat Beer on February 3, 2015 by Xander. 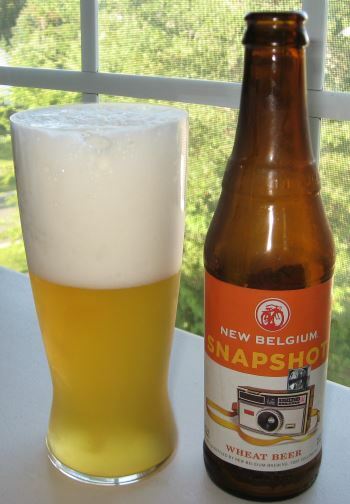 Snapshot is an unfiltered wheat beer from New Belgium, and I recently picked up a few for the first time in a mixed 12-pack. It’s very pleasant and mild. The nose is bready with a bit of lemon, and the head is meringue like. The middle is sweet with heavy orange overtones. The finish is more orange and a bit of wheat in the background which makes it relatively dry. It’s a very mild beer, which is a nice summer treat, and on top of that I think this would make it a great hit with the Blue Moon/Shocktop crowd. This entry was posted in Reviews and tagged Ale, Colorado, New Belgium, Wheat Beer on August 15, 2014 by Xander. 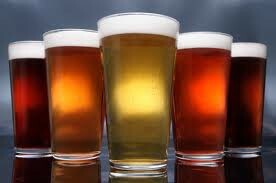 This is an open blog for all lovers and purveyors of great craft beers. When you are lucky enough to enjoy one of these great beers, please drop us a quick review at xander.sherry+opencraftbeer@gmail.com. All posts are moderated, so it might be a while before it goes live, please be patient. If you have any questions, please contact me at xander.sherry+opencraftbeer@gmail.com.